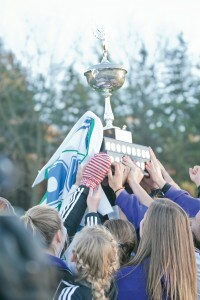 The Wilfrid Laurier University women’s soccer team is coming into next season with a target on their backs. Capping off last season with a thrilling final showdown against the undefeated Western Mustangs, the girls captured their first Ontario University Athletics banner in two years, and earned themselves another visit to nationals. The team accomplished this in what was supposed to be a rebuilding year. And now, they are preparing to do it all over again — but this time, they want to win it all. Backed by a solid returning core of players and supported by goalkeeper Maggie Carmichael, the Hawks are preparing to make another deep run into the finals with the intention of recapturing the OUA banner as the defending champion. Coming in as defending champions brings a lot of excitement for the upcoming season, and the memory of capturing the OUA title only adds to it. One of the big things the Hawks are looking forward to is the talented squad coming in, as well as the returning players from last year. “We’re looking forward to having an awesome season. We have some great rookies coming in this year so we have some great depth,” said midfielder Julie Maheu. “Our primary objective is to integrate [the new rookies] and catch them up to speed on how we want to play,” assistant coach Niki Budalic explained. One of these talented new rookies getting a chance to play is midfielder Maxine Murchie. She returned to Kitchener last season after spending a year playing with the University of Central Florida. However, because of the Canadian Interuniversity Sport transfer rules, Murchie had to sit out last season. The Hawks picked up right where they left off last season during their exhibition play. They showed dominance and perseverance in both matches. On Aug. 17 they overcame their quarter final rivals, the University of Ontario Institute of Technology Ridgebacks, 2-1 and then defeated the Waterloo United under-17 team 7-0 four days later. The goal for the Hawks this year is to find the formula that gets them back to the top spot in Ontario, and Budalic thinks building team chemistry is the answer. Maheu believes that putting in the effort every day is going to be what makes the difference. The season begins hosting the Windsor Lancers at University Stadium on Aug. 30.